Approved Document E is a document approved and issued by the Secretary of State, with the purpose of providing practical guidance with respect to the requirements of the Building Regulations with regards resistance to the passage of sound. The document outlines particular requirements and examples of solutions for some of the more common building situations. There may well be alternate ways to achieve compliance to regulations, thus there is no obligation to follow solutions contained in the document, but adoption of the guidance is the simplest way to comply. The latest version of the document was published in 2015 and has been effective from the 6th April 2015, incorporating amendments in 2004, 2010, 2013 and 2015 to the original 2003 edition. It provides guidance for compliance with the requirements of E1, E2, E3 and E4 of Schedule 1 of the Building Regulations. Approved Document E provides guidance on various elements of the built environment relating to the acoustic performance requirements of a building. The document focuses on the protection against sound within a dwelling/house, from other parts of the building or adjoining buildings and acoustic conditions in schools, incorporating performance requirements on door assemblies. 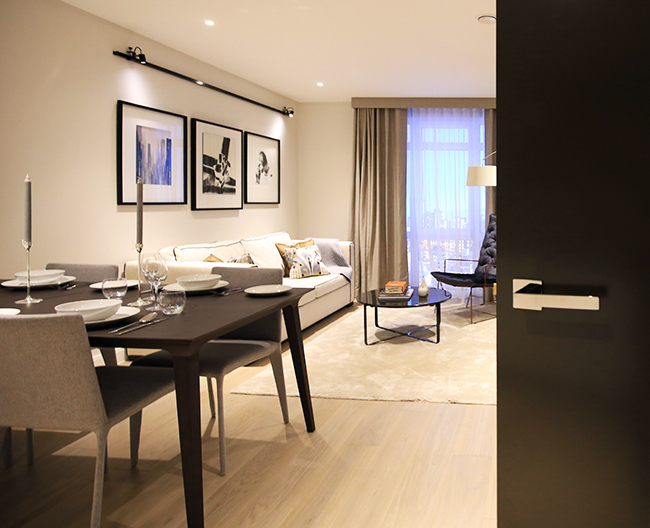 When specifying doors and the associated hardware, it is important to consider the requirements of the Approved Document E and how they apply to the door. Outlined below are the main areas detailed within the document which affect the door. Approved Document E states that Ensure that any door has good perimeter sealing (including the threshold where practical) and a minimum mass per unit area of 25kg/m2 or a minimum sound reduction index of 29 dB Rw (measured according to BS EN ISO 140-3:1995 and rated according to BS EN ISO 717-1:1997). The door should also satisfy the Requirements of Building Regulation Part B – Fire safety. It also notes that noisy parts of a building should preferably have a lobby, double door or high performance doorset to contain the noise. Where this is not possible, nearby flats should have similar protection. 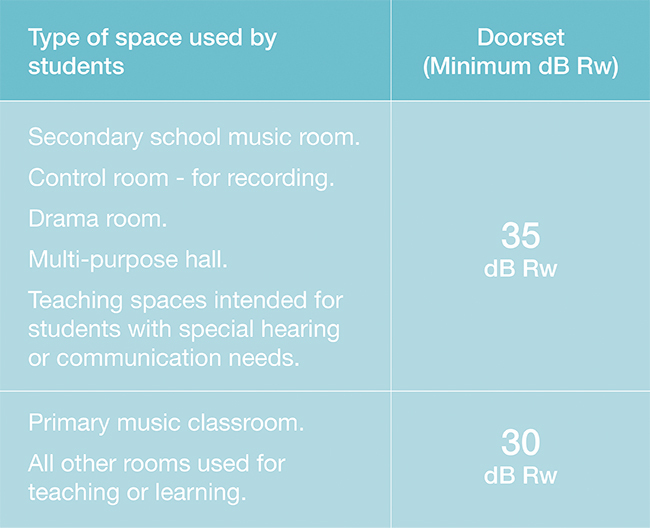 In section 0.12 of Approved Document E, it states that 'In the Secretary of State’s view the normal way of satisfying Requirement E4 will be to meet the values for sound insulation, reverberation time and indoor ambient noise which are given in Building Bulletin 93 Acoustic design of schools: performance standards'. First published on 1st January 2003 and last updated in February 2015, Building Bulletin 93 sets out the minimum acoustic performance standards of school buildings. Outlined opposite are the performance standards for sound insulation for doorsets. Approved Document E also provides guidance on meeting the Requirements of Part E2 and E3 of Schedule 1 to the Building Regulations. Please note that Requirement E2 does not apply to an internal wall which contains a door and Requirement E3 only applies to corridors, stairwells, hallways and entrance halls which give access to the flat or room for residential purposes. Thus, there are no acoustic performance requirements of the door stated for these requirements.